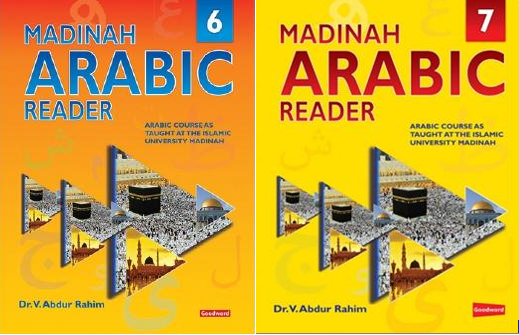 Madinah Arabic Reader is the children’s version of our Shaykh’s world renowned Arabic Course named Duruus al-Lughah al-“Arabiyyah li Ghayr al-Naatiqiina bihaa. Using the teaching methods of Madinah Islaamic University, lexical and grammatical elements, reading, writing and oral skills are taught in precise, methodical steps using colour-coded learning aids, vibrant pictures, activities and class practicals. A world of creative exercises test all areas of the young learner’s grammar, language skills and comprehension. NOTE: Madinah Arabic Reader Books 1-2, correspond to Duruus al-Lughah Vol. 1. Madinah Arabic Reader Books 3-5, correspond to Duruus al-Lughah Vol. 2. Volume 6, 7 & 8 correspond to Duruus al-Lughah Vol. 3. Authored by our Shaykh, published by Goodword Books (2013 CE). A4 size, coloured pages, artwork and illustrations, typographical devices,Harakaat placed on all the words, a wealth of new knowledge, and recommended for children and adult learners of Madinah Book 3. The new volume 6 corresponds to Madinah Arabic Book 3, lessons 1-5. Copyrighted material follows. For non-commercial use only with due acknowledgement. With kind permission of our Shaykh and Goodword Books.